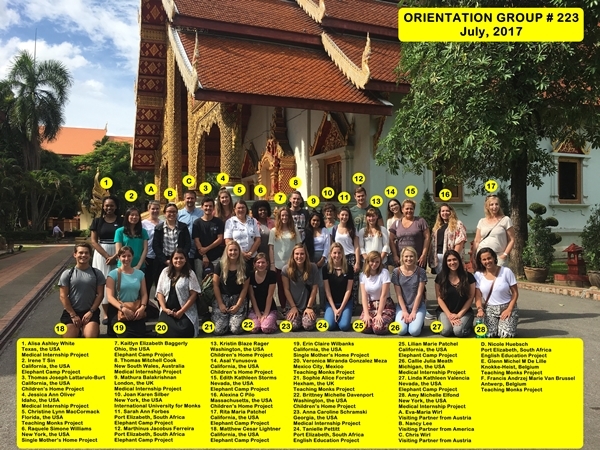 Presenting Chiang Mai Volunteer and Intern Group #223! It’s such a busy time of year for us that I’ve fallen behind on posting our new groups on our blog here. This group arrived earlier this month, and started on Monday, the 3rd of July. Most of them have already completed their projects, and have done a great job. Many of them conducted their close of project interview with me earlier this week and had some great stories and experiences to share. A group of 31 volunteers and interns, along with three visiting partners in this big group. So many people and projects represented (please see below) that I’m not going to list them here. For information on our project opportunities, please visit our projects page.